Implementing RFID technology gives retailers the edge they need to stay competitive in today’s retail environment. A successful pilot can provide a return on investment through increased inventory accuracy and improved insight into unique business needs – ultimately boosting customer satisfaction and sales. 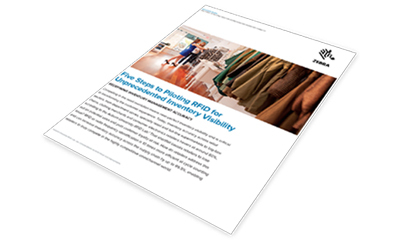 Get the guidance you need to execute a successful RFID pilot with our How-to Guide: Five Steps to Piloting RFID for Unprecedented Inventory Visibility. Please fill out the form below to receive your free guide. Subscribe to our email list for the latest news and updates from Zebra Technologies. ©2018 ZIH Corp and/or its affiliates. All rights reserved. Zebra and the stylised Zebra head are trademarks of ZIH Corp., registered in many jurisdictions worldwide. All other trademarks are the property of their respective owners.